As a result of our exclusive focus on the fashion industry; working with over 70 customers and our close partnership with SAP, we have been able to identify practices that have been proven to work across the industry. 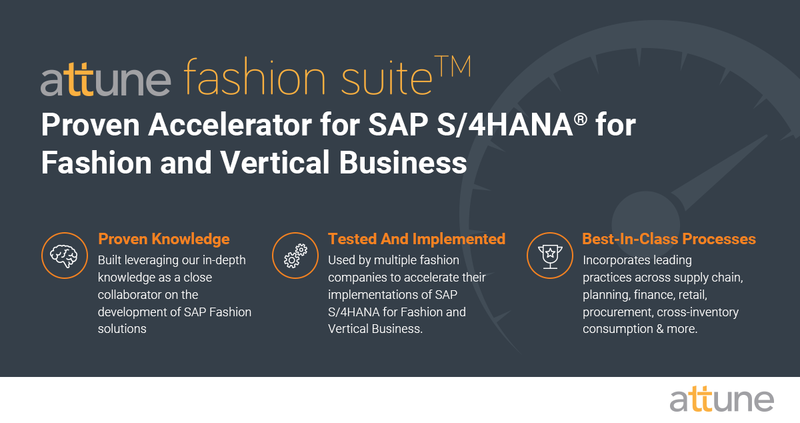 This unique position has enabled us to develop a pre-configured solution with SAP S/4HANA fashion as the base, offering brands a faster way to migrate to SAP S/4HANA for Fashion. The attune Fashion Suite really is a culmination of our efforts and experience of nearly 15 years in the industry. The objective is to offer brands and retailers a cost-effective solution that delivers all the benefits of SAP S/4HANA for fashion and vertical business via an accelerated path. Fashion Retail as we know demands speed – whether interacting with customers, bringing new products to market, expanding into new geographies or driving operational efficiencies, and that means the advantage goes to brands and retailers who are most responsive, agile and accommodating. attune Fashion Suite provides this advantage, by integrating the channels of a modern fashion business in less time and leveraging this combined view to serve the customer more effectively. Today, businesses expect quick wins from technology implementations and waiting around for years for results to materialize is no longer acceptable. But we strongly believe that businesses need to move away from fragmented solutions and look for results within a broader, enterprise-wide program, focusing on adoption of technology with rapid deployments and highly user friendly design. 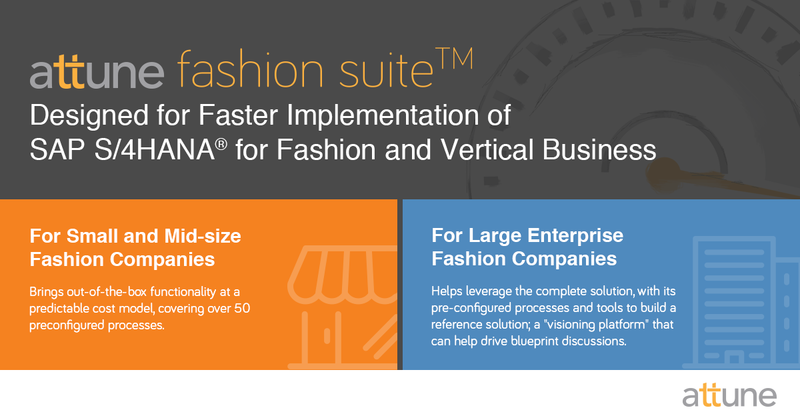 attune Fashion Suite brings the best of both worlds; you can start realizing the benefits of S/4HANA in several weeks, and it also provides a solid platform for an evolving, broader transformation program. Over 50 preconfigured processes across wholesale and retail operations, covering the majority of a typical fashion company's requirements around Supply Chain Management, Planning, Procurement, Finance, Optimized Wholesale and Retail distribution with cross inventory consumption, POS interfaces and other processes. The solution brings out-of-the-box functionality at a predictable cost model, covering over 50 processes. Build a reference solution that helps drive blueprint discussions and provide a strong base for an agile development phase.